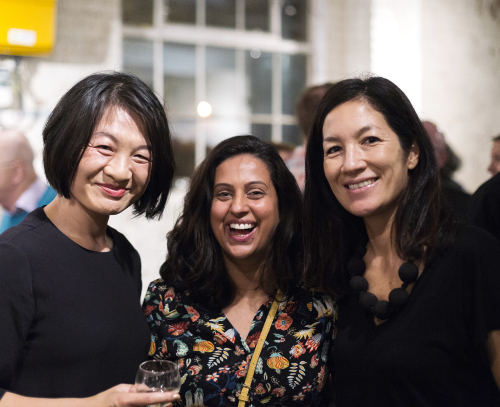 Iniva event at Guest Projects, October 2018. Photo by Christian Cassel. For nearly 25 years Iniva has been working to radically transform the visual arts landscape. To celebrate our quarter century we are inviting you to join our journey. We work predominately with British born and British based visual artists of African and Asian descent, supporting them at different stages of their careers. Many of those we have worked with have gone on to change the course of art history. Turner Prize winners Lubaina Himid OBE and Steve McQueen CBE, Yinka Shonibare MBE RA and Isaac Julien CBE, Idris Khan OBE, Sonia Boyce MBE RA and David Medalla are among Iniva’s distinguished alumni. By supporting us you will be helping to challenge conventional notions of difference and diversity. You will also be joining a debate on the politics of race, class and gender in the visual arts, and in our society. It is a debate that is just as urgent and important now as it was when Iniva was founded in 1994, and led by Iniva’s first Chair, renowned cultural theorist Professor Stuart Hall. You can become part of Iniva at three different levels – and if you join our journey now Arts Council England will match your contribution, doubling its value. To become an Iniva Friend click here. Director’s newsletters giving you all our news, advance notice of our events and recommending reading by our Stuart Hall Librarians. To become an Iniva Insider click here. Members of our Director’s Circle enjoy all the benefits above as well as having a special relationship with Iniva and its plans for the future including: an invitation to an annual event hosted by Iniva’s Director, behind the scenes access, and events hosted by Iniva’s Director and Iniva artists. To become part of the Director’s Circle click here. All support enables us to achieve our aims. It helps us work with partners nationwide to change the culture of commissioning and collecting the work of artists of colour in this country. It helps us buy new books for our specialist art collection, the Stuart Hall Library, and to hold talks and discussions. It helps our work in schools, where artists work alongside psychotherapists using art to explore identity and values. It helps us support young artists with commissions, and young curators through our traineeships and internships paid at London Living Wage to transform the diversity of the workforce. The easiest way to donate is by clicking on the donate buttons above which allow you to make donations by card or Paypal via our secure online payment system. For the donation levels you can set up a monthly or annual direct debit. Alternatively please phone or email Jenny Starr on 020 7729 9616 or email JStarr@iniva.org.